Written by Marlene Jahnke, PhD student working on seagrass population genetics at the Stazione Zoologica “Anton Dohrn”, Napoli, Italy. Seagrass meadows are one of the most important and valuable marine biomes, comparable to coral reefs and mangroves when considering biodiversity, economics and ecosystem services. Their role is so important because seagrasses are habitat-providing species as well as ecosystem engineers, meaning that they can modify their environment to the benefit of other species. For example, they are an important food source for charismatic and endangered species such as sea turtles, dugongs and manatees, and provide nursery grounds and shelter for commercially important species. In addition, they are responsible for exporting important amounts of carbon, nitrogen, and phosphorus to coastal food webs. Other ecosystem services that seagrasses provide include influencing nutrient cycling and the food web structure, reducing wave impact, stabilizing sediments and adding oxygen to the water. In addition to them being our planet’s “blue lungs”, seagrasses are also a very important sink for carbon. One third of anthropogenic CO2 emissions are absorbed by oceans, also known as “blue carbon”, and much of this is due to seagrass meadows, mangroves and tidal salt marshes. 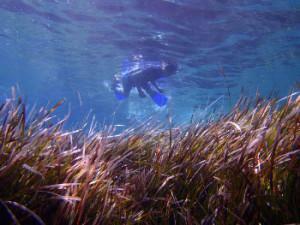 Snorkelling in Posidonia meadows is an amazing experience. Photo: M. JahnkePosidonia oceanica or Neptune’s Grass is a seagrass species native only to the Mediterranean. In contrast to algae and seaweeds that are very common in the sea, seagrasses are plants that produce flowers, fruits and seeds and are pollinated under water. The presence of Posidonia meadows is a sign of good water quality with low turbidity levels, as Posidonia needs considerable levels of light in order to perform photosynthesis. Posidonia oceanica is a very important habitat for all three species of sea turtles in the Mediterranean and a source of food for green turtles. A great number of other species use these meadows as their favourite habitats, such as octopus and the Pinna nobilis, a charismatic endangered bivalve that is unique to the Mediterranean. Unfortunately, seagrass habitats are among the most threatened ecosystems on earth. Since 1990, the rate of loss of seagrasses has increased to an estimated 7% per year globally, a worrying rate that is comparable to mangroves, coral reefs and tropical rainforests. Although Posidonia oceanica is classified as “least concern” in the IUCN red list, up to 50% may have been lost just in the last 50 years in the Mediterranean. The main threats are eutrophication, pollution, trawling (fishing), dredging and mooring. 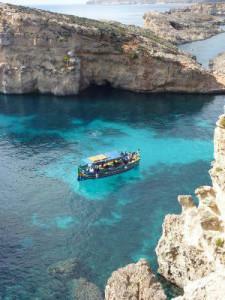 Mooring by yachts and pleasure boats has a huge impact on Posidonia meadows in many areas of the Mediterranean. The anchor or the chain removes Posidonia shoots and leaves a bare patch of sand. Posidonia is an exceptionally long-lived and slow growing species, so it takes a VERY long time for it to reclaim these patches. Individual shoots grow decades old, and over centuries the rhizomes build reefs, called matte, that can reach heights of several meters. Sexual reproduction is rare and genetic diversity is often low, so patches are mainly re-colonised by clonal extensions from remaining shoots. Even a small patch cleared by the anchor of a boat that remained for just one hour can take 10 years to grow back! And for a bigger patch, for instance cleared by bottom fishing, it may take longer than a human life time to recover. Clearing also leads to habitat fragmentation, which makes the Posidonia meadows less resistant to other disturbances such as invasive species or pollution. Posidonia oceanica usually sheds leaves in the autumn and the leaf litter, which can be centimetres to metres high, is commonly found on beaches along Mediterranean coasts. This is often seen as a nuisance for tourist activities. However, this leaf litter plays an important role for the functioning of coastal ecosystems and its removal has an impact on nutrient availability and can lead to beach erosion. when on holidays, make sure your hotel is connected to a good sewage treatment system and does not clean Posidonia leaf litter from the beaches. And enjoy them! Snorkeling in Posidonia meadows is an amazing experience: as habitat providers they enable you to see a range of different species in one place – and maybe even a sea turtle!